Advertisements for payday loans make them seem like a fast, easy, no-nonsense way to get money when you’re in a financial bind. They tell you getting $100 is as easy as showing a recent pay stub, a copy of your driver’s license, and a blank check. They don’t tell you that for many people, paying off that $100 can end up taking months, even years, and costing thousands of dollars. Let’s say you need to borrow $100 until your next payday. You write the lender a postdated check for the amount of the loan plus the fee. Lenders calculate payday loan fees in one of two ways: as a percentage of the amount you borrow, like 10%, or as a set amount per $1 borrowed, like $15 for every $100 borrowed. After you write the check, the lender gives you the cash or automatically deposits the loan into your checking account. Then, on your payday, the lender cashes your check unless you extend the loan. Extend the loan, also known as “rolling over” the loan, costs another fee and allows you to keep the loan for another period. You're charged a fee each time you roll over the loan. The Truth in Lending Act requires all lenders, including online payday loan lenders, to disclose the cost of the loan in writing before you sign any agreement to take the loan. They must give you this information in terms of the finance charge and APR (annual percentage rate). Even after reading this information, you might not understand just how expensive payday loans truly are. For example, one payday lender, Cashcentral.com, charges $17.50 per $100 borrowed. On a 10-day loan, your effective APR is nearly 640%. This is 15 times more than some of the most expensive credit card default rates. If you took out a 14-day $300 loan and couldn't repay it for two months, you'd end up paying $210 in payday loan fees. The same scenario with a credit card would result in less than half the fees, even if you ended up with late charges. A 2006 report by the Center for Responsible Lending reveals a typical payday borrower ends up paying $793 in interest on a $325 loan. This lender doesn’t charge an upfront finance charge that high. Instead, the borrower pays that amount over a period of time by continuously rolling over the loan. Borrowers often find themselves taking out new payday loans to cover old payday loans and ultimately end up owing thousands of dollars on what started out as a few hundred dollars of debt. Over and over, statistics show that payday loan companies aim to take advantage of poor consumers. 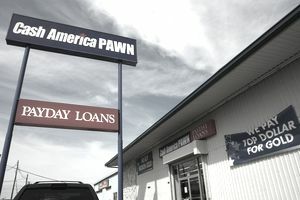 You’ll seldom find any payday loan stores in the upper-middle class suburbs of the city, where borrowers could actually afford to repay the loans. Instead, you’ll find them in the poor and black neighborhoods of the city and near military bases. For example, a Yahoo Maps search resulted in 12 cash advance and payday loan businesses within five miles of Fort Knox, Kentucky, a U.S. military post. It wouldn’t be right to completely dismiss payday loans without providing some alternatives.